I keep a handwritten log book for my dives. When I started out, it was the norm, but as I dive more and more I see it less often. Dive computers are set up to connect to your computer via USB, and increasingly, blue tooth. It is no longer necessary to manually write out each dive, as the dive date and information can be transferred so easily. I should say, some information can be transferred so easily. my little piece of diving history. But I still find joy in keeping a handwritten log book. 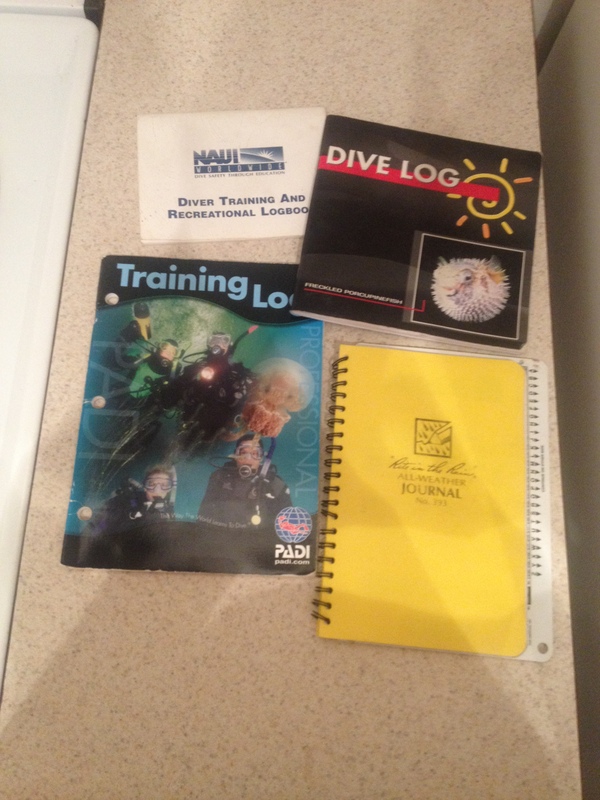 I have my book from my open water class, and, encouraged by my instructor, the notes I wrote to accompany each dive. It’s so endearing….The notes from the very beginning. The wonder, the excitement, the hurried scrawls. The drips of water on the page, and with them, the memory of sitting and writing them on a park bench by the beach in Goleta. I’ve gone through four log books. I use a water proof notepad now, and sometimes dives just constitute a single line: depth, time, dive site, date, dive #. Sometimes I put notes in about new equipment, or changes in weight. Sometimes I write notes for my personal liability, if something happened that I needed to remember. I don’t keep a journal, but these hand written notes are like little love letters to my future self, and to the ocean, my dive buddies, and to the wildlife I’ve encountered. Old notes are like finding some embarrassing poem you wrote in high school, and that’s how the notes I write now will look in 10 years. But it’s my personal evolution, my personal story, sometimes told in sparse words, sometimes in many paragraphs, and sometimes just in the way of the writing. Some word for word excerpts. What’s your best logged dive?